Two deep and wide concrete soakers complete with filters, steps, hand railings and protected inside an animal resistant fence - 2 changing rooms, 2 bathrooms, 2 picnic tables, 2 bbqs and 1 large fire pit on premises. Cleaned every Wednesday morning by the BLM. Dirt road leading to the hot spring can be impassible when wet - otherwise open all year. No camping/overnight use. 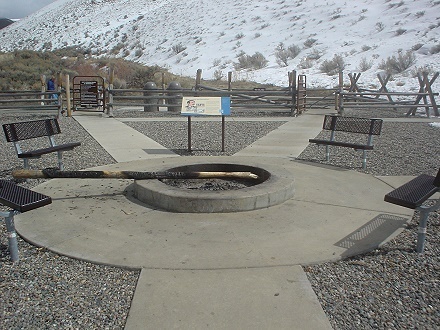 Nearest camping is in Salmon-Challis National Forest. Clean as a whistle. 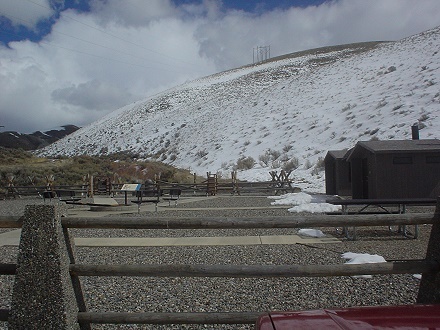 The BLM takes incredible care of this special place and cleans the pools every Wednesdy morning. 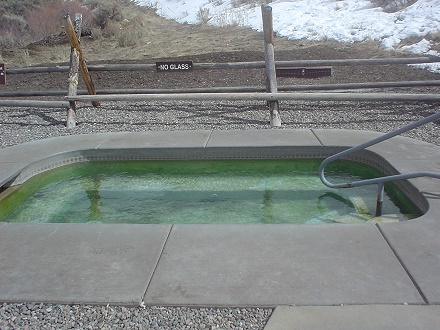 The two resortish-like soaking pools at Sharkey were built by the BLM during the summer of 2001, they were stellar. Even up to 2003, the date of my previous visit, the two pools were still good. After this last visit, I now consider the pools to be in moderate condition. 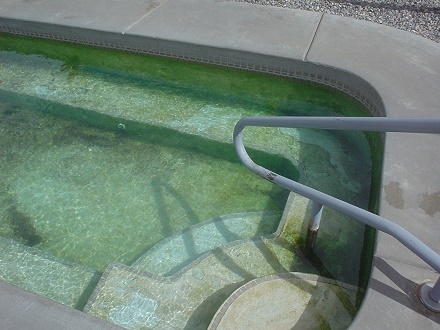 Clear signs of the worsening condition of the concrete housing were visible, and each pool contained a fair amount of slick algae. However, the most blatant difference I noticed is that trash was everywhere! At least the restrooms and changing rooms were in decent condition. 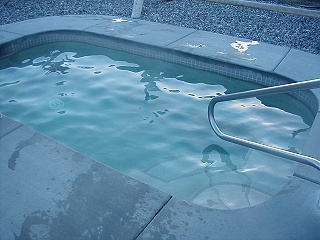 A great soak was shared with a couple visiting the area from Montana. About 20 minutes into our soak we heard quite the commotion. Someone was shooting down the dirt road at a very high speed and came ripping into the hot springs parking area. This pickup drove up to the fence, perpendicular to the parallel parking spots, and almost through it! It was the county Sheriff. Wow, quite the dramatic entrance. After a good sneer and a scowl, the Sheriff ripped on out just as fast as he came in. The Montana couple made a few remarks about the 'law in these parts' after some talk about receiving a ticket recently that wasn't legit. All I know is that wasn't necessary. If the guy was really looking for someone, our vehicles and license plates were clearly visible in the parking lot. All of that aside, it was a great soak with good company. The hot 102-103 degree water was a welcome contrast to the cold, crisp mountain air. After soaking, the couple even fired up one of the on-site grills and shared some grub and brew. It was refreshing to have such a great soak and meet some friendly folks, a combination I find to be quite rare in Idaho sometimes. They even started picking up trash first, FTW! 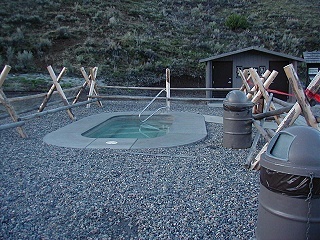 Sharkey is also known as Lewis and Clark Hot Springs (along with a few others). Why? Because Lewis and Clark came through here. Sharkey was a treat. The BLM did a great job developing this area during the summer of 2001. One could conclude that Sharkey has returned to a more modern day rendition of what it once was in the twenties when it was a large concrete pool complete with changing rooms. See the Pool Condition above for the details of what Sharkey is like now.